Weeke Barton should feel like a home from home and at the same time offer everything you need for a special time away. Although we are here to help, you are also free to just be. We have been mindful in our choices of products, ingredients and design, we always strive to leave as small an environmental footprint in this special part of Dartmoor as we can. Its just us and the very lovely Sarah doing what we love to do, oh and our ever ready to play spaniel, Coco. With the occasional appearance from the nearly teenage son. We designed the rooms to offer space and luxury within this ridiculously old house. Uncluttered but with everything you need including a hairdryer and shower cap ( important stuff to some ). Statement linen is a must. Ours is 600 count Egyptian cotton and wrapped around 100% goose down duvets. Its like sleeping under a cloud. We keep our towels fluffy and extra large ( is there any other way? ), and there's a simple cotton robe. St Kitts Herbery is about an hour from here and make wonderful products from the herbs they grow on site. The rosemary and bergamot is just gorgeous. We offer hand wash and a hair and body wash. It is slightly addictive as an aroma - you can order their products direct from them or go for a visit and try their cool little cafe too. We are all about the social, and it "triumphs" best with food. We offer 2 services. Kids all together around 5pm, then adults all together around 8pm. You will receive the menu before arrival (all diets catered to) and it is prepared here from scratch. We source our meat from responsible local farmers and our fruit and veg from friends and our local greengrocers. We cook what we love and what's in season. That can be anything from a hearty pie to octopus stew, fresh ice creams and sorbets to local cheeses. 2 or 3 courses, tea and coffee included. For group bookings we offer a bespoke menu also. Breakfast at Weeke Barton is a relaxed time of day. Served between 9-10am (if your up with the larks just let us know) in the dining room or on the terrace weather permitting. We serve Devon apple juice, Italian coffee, homemade granola. Backed up with a cooked breakfast menu made up from fresh Dartmoor ingredients, homemade bread and prepared to order. We also offer gluten free and vegetarian options - just give us the heads up first. Everyone should have their own bar. Ours is honest and fully loaded, open to guests 24/7. It is snug and old skool cool. 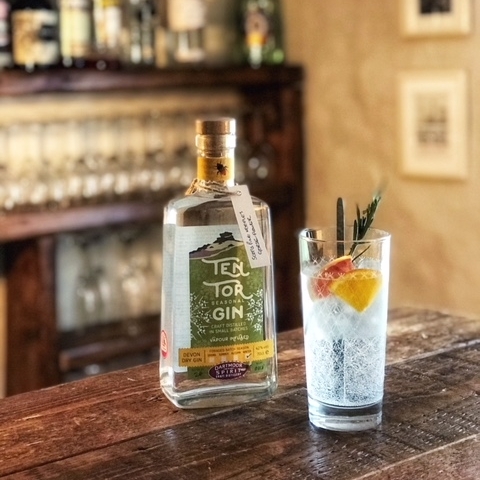 We looked local first - think Dartmoor botanical gin, Dorset milk vodka, next door's sparkling wine, Dartmoor ale and Devon cider then we choose Bio-dynamic wines selected for their flavour and credentials. The rest is a bartenders wall of fame - caribbean rum, scottish malts, french cognacs to name a few. Shake your own martini, pour your own beer. Play bartender, its a great game. You can BYO if you have something special we do not stock, we do charge a corkage of £10 per bottle if you do. Set to the front of the house is nearly 5 acres of lawn and field. Built into 3 tiers, there's plenty of space for just you or all of you. The top lawn offers high views up and down the valley and a pétanque pitch, The next lawn houses a huge wooden table that seats 12 comfortably. Down again and you will find cosy corner with seats and an outdoor wood burner, chiller and power points... need we say more. Look down to the "sports ground" - well large flat lawn perfect for footie, cricket or croquet, and follow the stream to the den. Rustic fun for adventurous kids who love a bit of mud and river action. And then theres the field. Open plan with scattered hammocks. Perfect.